Anonymity in Lottery: Which Countries Allow Identity Protection? Believe it or not, there are downsides to winning the lottery. If your identity has been made public, don’t be surprised if long-lost relatives and acquaintances suddenly come knocking on your door asking for a handout. Or worse, you could end up being targeted by criminals looking to lure you into a scam or being subjected to physical harm! Wouldn’t it be nice if you could just keep your identity a secret after winning a huge lottery jackpot? You can but this depends on where you live. Governments dictate whether you can stay anonymous or not. Read on! The United States has many different lottery rules and regulations. Out of the 50 states, only seven of them currently allow lottery jackpot winners to stay anonymous: Delaware, Kansas, Maryland, North Dakota, Ohio, South Carolina, and Texas. On the other hand, states like California, Washington D.C., Wisconsin, and even U.S. territories like the U.S. Virgin Islands and Puerto Rico, all forbid jackpot winners to stay anonymous. And then there are the states where winner anonymity is conditional. Colorado, Connecticut, Massachusetts, and Vermont, allow winners to claim their prize via a trust—and usually, a lawyer—so they don’t have to disclose their name in public. Meanwhile, states like Illinois and Oregon only allow winners to stay anonymous if they demonstrate a high risk of harm. In Canada, all lottery winners are required to go public in the interest of transparency. Regardless of which Canadian lottery is involved, winners all go through a photo shoot where their identity, including their name, face, and the municipality they live in, are made public. Purchasing a winning ticket for any Canadian lottery is essentially an agreement that you must participate in a publicity campaign—a big media hoopla equals more ticket sales, after all. In the UK and Europe, rules on anonymity work a lot differently. Games under the UK National Lottery umbrella—such as Euromillions, UK Lotto, and Thunderball—give winners the option to publicly declare their win or stay anonymous. The best part is that there is no catch if you want to stay anonymous. So, if you want, you can completely avoid the press conferences and photo shoots without having to form a trust or hire a lawyer just to claim your winnings. Ironically, a lot of people in the United Kingdom actually choose to go public instead of staying anonymous. Most say that it’s better to accept the fifteen minutes of fame rather than try to constantly avoid the near-endless hounding of the media. And the British tabloids are infamous for their celebrity gossip, sensationalistic front pages and how far they go to get that story. Australia’s neighbor New Zealand also allows lottery winners to remain completely anonymous regardless of how much they win. Unlike in the UK, a majority of winners in New Zealand, an estimated 99.5%, preferred to protect their identity. In China, winners can choose to go public or remain anonymous, though it is highly recommended by lottery officials that winners choose the latter option for security reasons. Regardless of which option players ultimately choose, every winner is required to claim the check in person and participate in a publicity photoshoot. So, how can lottery winners stay anonymous if they are expected to appear in public? By wearing costumes, as it turns out! Throughout the years, it’s become a tradition of sorts among lottery winners to don colorful costumes when claiming their check to protect their identity. So, if you ever chance upon a Chinese news story about a lottery winner, don’t be surprised to see Mickey Mouse, Baymax, or other familiar (or unfamiliar) characters claiming a big, fat check for RMB 565 million! Although many would welcome the option to stay anonymous upon winning a huge jackpot, not everyone feels the same. 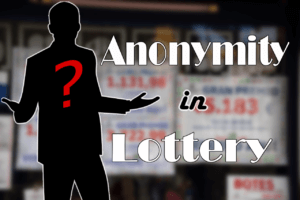 Critics argue that allowing winners to stay anonymous questions the legitimacy of the lottery. Announcing winners to the public ensures transparency and proves that winners are real people—not an imaginary person made up by lottery officials. Other critics argue that allowing winners to remain anonymous makes it far easier to cheat the lottery system. According to Dan Russell, a former Florida Lottery attorney, anonymity essentiallyacts as a “layer of assistance” for those looking to rig games in their favor. In other words, requiring winners to go public is just another security measure to guard against possible cheating. For example, Eddie Tipton, the now-infamous lottery fraudster who rigged multiple lotteries and enriched himself and his cohorts for over a decade, was caught following several failed attempts to anonymously cash in a winning Hot Lotto ticket worth $16.5 million. Of all the security measures that Tipton managed to circumvent, it was the policy on anonymity that caused the start of his downfall. However, a strong case for anonymity can be made when a winner becomes a target for criminals. For example, Abraham Shakespeare, a lottery winner, disappeared in Florida in 2009, three years after he won $30 million. His bullet-ridden body was found buried under a concrete slab and a “business associate and acquaintance” was convicted of first degree murder and other charges. This “friend” offered to write Shakespeare’s life story but instead swindled him out of his jackpot winnings and ultimately murdered him. But the Shakespearean drama doesn’t end here. Ironically, the mother of Abraham’s son won $1 million in a scratch-off Monopoly game in Florida in 2017. Hopefully, this story will have a happy ending—more All’s Well That Ends Well versus Romeo and Juliet! What about you? Do you believe that lottery winners should be made public or should they be given the option to stay anonymous? Sound off in the comments below!